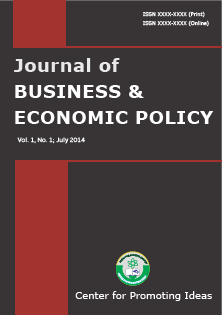 Journal of Business & Economic Policy (JBEP) is indexed with the follwing organizations. Cabell Publishing, Inc. helps professors, graduate students, and researchers publish their manuscripts in academic journals. It strives to maintain current information on over 4,000 journals. This information includes addresses, phones, e-mails and web sites for our listed journals making Cabell's Directories an easy point of reference when preparing to publish a manuscript. We also provide links directing you to guidelines and submission information. Cabell Publishing, Inc. produces directories of publishing opportunities in the following areas: Accounting, Economics and Finance, Management, Marketing, Educational Curriculum and Methods, Educational Psychology and Administration, Educational Technology and Library Science, Psychology and Psychiatry, Computer Science, Health Administration and Nursing. The Directory helps you to determine which journals typically publish manuscripts similar to yours or could be the best fit for your manuscript. The index in each Directory helps you match the characteristics of your manuscript to the topic areas the journal emphasizes and acceptance rate. The Directory also includes information on the style and format of most journals to further assist you in organizing and preparing your manuscripts. If a journal has its own set of manuscript guidelines, a link to these guidelines is provided in the Directory. Additionally, each entry indicates the use of a standard set of publication guidelines by a journal. For example, some journals use the Chicago Manual of Style or the Publication Manual of the American Psychological Association. Furthermore, the Directory describes the type of review process used by the editor(s) of a journal, type of review, number of reviewers, acceptance rate, time required for review, availability of reviewers' comments, number of copies required and manuscript topics. Information on the journals printed and electronic launch dates and ISSNs are also provided. Ultimately, Cabell's Directories of Publishing Opportunities is an excellent resource to use because it eliminates a lot of legwork as you prepare to publish your manuscript. Ulrichsweb™ is the authoritative source of bibliographic and publisher information on more than 300,000 periodicals of all types–academic and scholarly journals, Open Access publications, peerreviewed titles, popular magazines, newspapers, newsletters, and more from around the world. And, it's easy to use! Directory of Open Access Journals (DOAJ) covers free, full text, quality controlled scientific and scholarly journals. We aim to cover all subjects and languages. There are now 6265 journals in the directory. Currently 2712 journals are searchable at article level. As of today 532686 articles are included in the DOAJ service. JournalSeek is the largest completely categorized database of freely available journal information available on the internet. The database presently contains 97068 titles. Journal information includes the description (aims and scope), journal abbreviation, journal homepage link, subject category and ISSN. Searching this information allows the rapid identification of potential journals to publish your research in, as well as allow you to find new journals of interest to your field. IndexCopernicus is a journal indexing, ranking and abstracting site. This service helps a journal to grow from a local level to a global one as well as providing complete web-based solution for small editorial teams. IC helps to professionally manage your journal from your location and automatically delivers XML files to Medline. This service accepts, peer-review and tracks manuscripts online and builds up relations with authors, reviewers and readers as well as increasing the international awareness of a journal. For more information, visit www.proquest.com or the ProQuest parent company website, www.cambridgeinformationgroup.com. Gale®, part of Cengage Learning, is a world leader in e-research and educational publishing for libraries, schools and businesses. Best known for its accurate and authoritative reference content as well as its intelligent organization of full-text magazine and newspaper articles, the company creates and maintains more than 600 databases that are published online, in print, as eBooks and in microform. The Gale family of publishing imprints includes such noted reference brands as Macmillan Reference USA™, Charles Scribner's Sons® and Primary Source Media™. Gale also serves the K-12 market with its U.X.L®, Greenhaven Press®, Lucent Books®, KidHaven Press and Sleeping Bear Press™ imprints. Thorndike Press®, Christian Large Print™, Wheeler Publishing™, Five Star™ and Large Print Press™ serve libraries' large print collections. Major brands include InfoTrac, Gale Virtual Reference Library — the company's eBook platform — and the unparalleled Gale Digital Collections such as Eighteenth Century Collections Online. In addition to serving the school and library communities, Gale also licenses its proprietary content for integration within Web-based information services. Nearly 100 organizations — including Looksmart, Borders, Dow Jones and Thomson Financial — presently enjoy strategic business distribution partnerships with Gale. Gale is based in Farmington Hills, Michigan, with additional offices in the U.S., and in the following international regions: Europe, the Middle East, Africa, Asia, Australia, New Zealand and Latin America. The Australian Research Council (ARC) is a statutory authority within the Australian Government's Industry, Innovation, Science, Research and Tertiary Education (IISRTE) portfolio. The ARC advises the Government on research matters, manages the National Competitive Grants Program, a significant component of Australia's investment in research and development, and has responsibility for the Excellence in Research for Australia (ERA) initiative. The ARC fosters excellence, partnerships and the highest ethical standards in research and research training in all fields of science, social sciences and the humanities. The Excellence in Research for Australia (ERA) initiative will assess research quality within Australia's higher education institutions and will give government, industry, business and the wider community assurance of the excellence of research conducted. It will also provide a national stocktake, by research discipline areas, of research strength against international benchmarks. International Journal of Business and Social Science is listed in ERA 2012 list. The company Massmann International Booksellers was founded in 1989 by trained booksellers Dorothea and Kay Massmann in Hamburg and has operated since then as supplier and service provider for university and research libraries in the Federal Republic of Germany. We specialize in the procurement of books and monographic continuation orders from German and foreign publishers and run a large journals department. Our service includes procurement of software, eBooks and CD-ROMs too. Our innovative company employs thirteen permanent, qualified members of staff, who passes on their knowledge and experience to younger members. At present there are two such trainees. In this way we demonstrate social responsibility and fulfill the requirements for government contracts while laying the foundation for meeting the high and varied demands of our customers with a qualified team. We have a clear policy of closely following the needs and expectations of our customers and providing a professional service. This includes quick and effective responses to changes in the procurement and distribution markets. Short processing and delivery times, online status reports on current orders, taking over outsourcing projects and our well-trained staffs, who understand the special requirements of libraries, are the basis for our long-standing, trustworthy business relationships. Two of our main company aims are the maintenance and promotion of our creative and innovative approach in order to ensure a high degree of customer satisfaction and permanent improvement of processing methods for the benefit of our customers.